My college girlfriends are my second family. It's rare the five of us all get to be together at the same time, but when we do, it's always hours and hours of catching up, reminiscing, laughing, and wine! We typically sit around in our PJs talking... Just like college when we lived on the Phi Mu hall. Living with your best friends for four years is such a blessing, but when it's all over, you wonder if it will ever be the same. Well, the truth is, it's not. Everyone starts living their own lives - some move, some get married, some have children - but one thing never changes, those girls from college remain your lifelong best friends and sisters. I cherish mine dearly, and when we're old and grey, I know they'll still be my best friends. Last weekend was the first time in a few years all five of us were all together. We had a big Christmas dinner and played the Dirty Santa game. For my Dirty Santa gift, I went the homemade route - I always just feel it to be more fun and more personable. I think everyone loves a good cocktail - particularly around the holidays, so I created my own cocktail making kit. Homemade lavender and lemon vodka and homemade vanilla syrup... Mix the two together, top with seltzer water, and you have yourself a mean holiday cocktail! My gal, Sara, ended up with the gift. She drank it this weekend and said it was fabulous! Since this week is her birthday, I'm dedicating this cocktail and post to her!!! Infuse your vodka. In a large jar, add vodka, limoncello, and lavender. Let sit for 4-7 days. Decorate bottles. Wrap ribbon like a scarf around the neck of the bottles and string the ornament or decoration around the ribbon to hang in front. You could also just do a simple bow with the ribbon. Add the chalkboard stickers. I like to write on them first, as handwriting is more difficult when they're already on the bottle (you can also wait until the liquid has been added to the bottle to do this in case of any spilling). *** Add a piece of chalk or two in the gift box or basket. What's so great about these bottles is they can be reused. They're great for storing homemade salad dressings, sauces, and simple syrups in the fridge. The chalk writing can be erased and rewritten! The day of, make the vanilla syrup. Split the vanilla pod and take out all the vanilla seeds. Bring sugar, water, vanilla seeds, and pod to a boil and let cool. Add the used vanilla pod to the bottle labeled "Vanilla Syrup." Using a funnel, transfer the syrup to the bottle. Add a lavender sprig to the bottle labeled "Lavender Lemon Vodka," and transfer the infused vodka to the bottle. 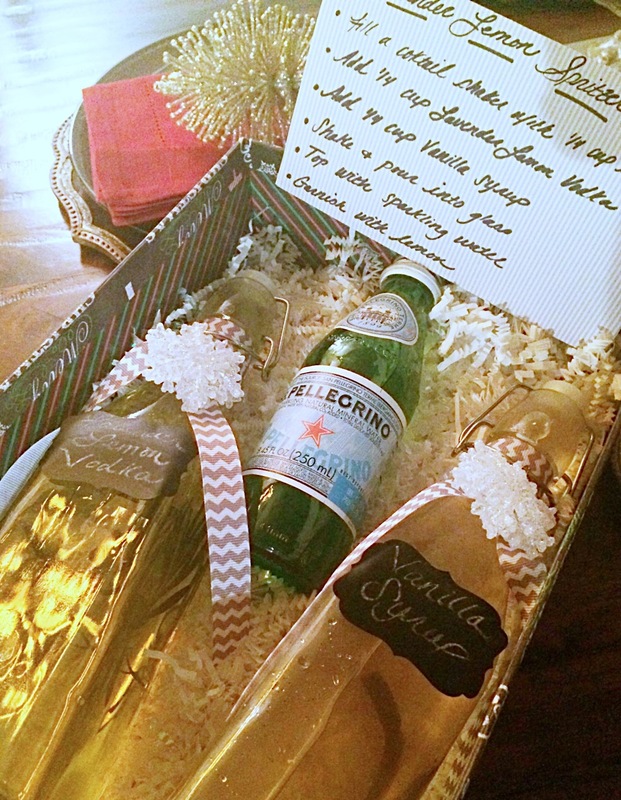 Close the bottles up, make sure they don't leak, and add them to the gift box or basket with the seltzer water. Write recipe with the Sharpie or marker on the craft paper (see recipe below). Add to the box or basket. 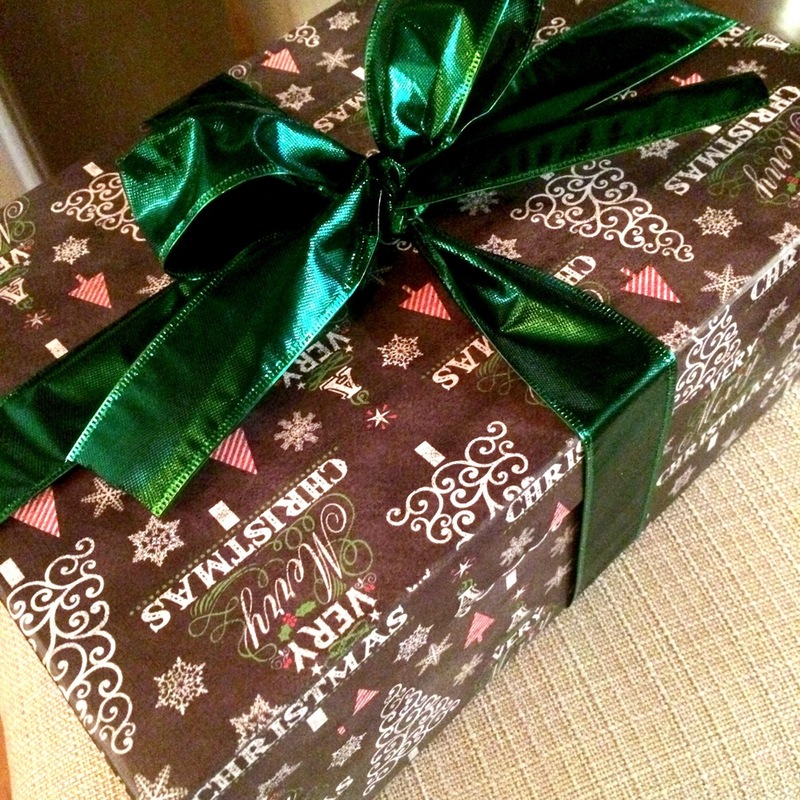 Use the ribbon to tie around the box or basket to make the gift festive and pretty!